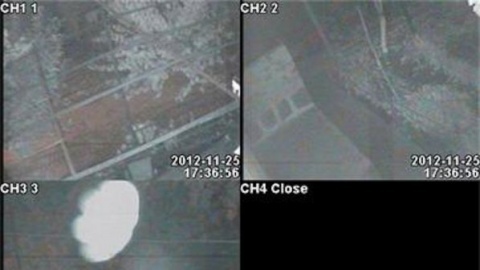 The security camera photo of the UFO allegedly spotted in the Bulgarian town of Lom. An object, believed by locals to be a UFO, has been spotted flying in the sky above Bulgaria's Danube town of Lom on November 25th. "I saw through the window something like a shining fog and felt a sharp pain in my head. I also felt pinned to my bed and was able to get up only after the light disappeared," a female local resident, 71, says. Meanwhile, her son, who works as security guard, has been in the yard, and also saw the UFO. He has pictures of it from the security cameras he had installed around the house. "I am willing to send the tapes to the Institute for Space Studies at the Bulgarian Academy of Sciences," the man says. Neighbors are also convinced that their town has been visited by a UFO. Locals have even given a name to the UFO – "Shinny."